NASA has announced that The Boeing Company has successfully completed the first milestone needed for the aerospace company’s work to fulfill their agreement on NASA’s Commercial Crew Transportation Capability (CCtCap) contract. This is the first major step in the final phase of NASA’s Commercial Crew Development program that will eventually lead to Boeing’s Crew Space Transportation (CST)-100 spacecraft sending crew members and other supplies to the International Space Station (ISS). 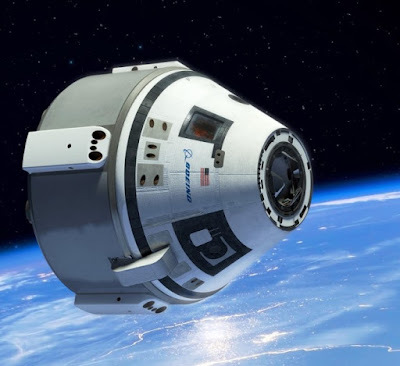 The milestone reached for CST-100, called The Certification Baseline Review, involved Boeing’s demonstration of a comprehensive design for their planned crewed missions. This submission involved the spacecraft’s baseline design, concept of operations and management and insight plans. NASA has approved the overall path Boeing has planned with its current development of CST-100, including the total phases needed to prepare for manned mission. This baseline review completion signifies NASA’s signing off on the beginning of construction for test hardware, crew and service modules, and CST-100’s launch vehicle adapter, which is being built by United Launch Alliance (ULA) for eventually launch aboard an Atlas V rocket. With the approval of this baseline review, Boeing has a clear path to follow for reaching their goal for their first manned mission to low-Earth orbit (LEO) by 2017. But Boeing representatives are not releasing the specific number of milestones for CST-100 at this time. Boeing is currently building three CST-100 spacecraft’s at NASA’s Kennedy Space Center. The first will be used for a pad-abort test scheduled for 2016, second for an unmanned test flight in early 2017 and a third spacecraft for their first crewed mission planned for 2017. Boeing officials have also shared that CST-100 has completed its review board for the spacecraft’s second milestone for NASA’s CCtCap. This is the Ground System Critical Design Review (CDR), and involves support systems planned for ground operations, a mission control center, simulators and others ground-based operations. NASA should sign off on this second CCtCap certification for CST-100 within the next few weeks, Boeing says. CST-100 will undergo another certification review board with NASA next week involving a phase two safety review. This will look at integrative systems that have been developed by different groups within Boeing and to triple check their overall compatibility. Boeing’s CST-100 spacecraft was selected along with SpaceX’s Dragon spacecraft on Sept. 16 to fully develop a spacecraft to deliver crew on missions to the ISS starting in 2017. Along the way, Boeing and SpaceX have been competing through several developmental phases along with other private companies including Sierra Nevada Corporation and Blue Origin. A cold and dark night in Kazakhstan was illuminated by the white-hot glow of Russian RD-108A and RD-107A rocket engines, as the Expedition 42/43 crew members aboard their Soyuz TMA-15M spacecraft blasted off towards low-Earth orbit (LEO). Their prime mission once they arrive at the International Space Station (ISS) will be the continued operations and upkeep of the orbiting laboratory and working with an array of ongoing scientific missions. Liftoff took place at 4:01 p.m. EST (3:01 a.m. Baikonur time). The temperature outside was a chilly 18 degrees Fahrenheit. The Soyuz-FG launch vehicle helped to warm things up a bit when it fired its four main engines and began its journey to orbit. Kazakhstan, like its neighbor Russia, is known for its notorious winters, where the bitter cold can reach well below freezing which is a common occurrence when winter is in full force. Roscosmos engineers and technicians appear to have perfected the materials and techniques needed to conduct successful launches in these extremely cold conditions. Russian cosmonaut Anton Shkaplerov, NASA astronaut Terry Virts and European Space Agency (ESA ) astronaut Samantha Cristoforetti make up this crew who are currently in-route to join their fellow Expedition 42 crew members, NASA astronaut Barry “Butch” Wilmore and cosmonauts Alexander Samokutyaev and Elena Serova who are already aboard the ISS. The three diverse crew members from different countries and cultural backgrounds, all felt the same crushing G-force sensation of 3.6 to 4.2 Gravity’s as the rocket left the launch pad. Despite their differences, the trio do share one thing in common, they are all members of their respective countries’ Air Forces – a fact reflected in their mission’s patch. 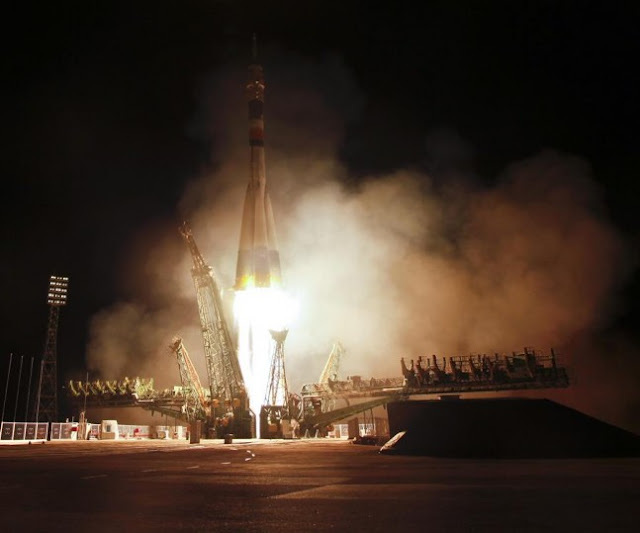 The Soyuz-FG rocket used the force of it’s four booster engines, fueled by a mixture of Rocket Propellant 1 (RP-1) and Liquid Oxygen, to break the hold of Earth’s gravity on craft and crew. NASA astronaut Terry Virts is returning to the ISS in a far different method from when he first arrived in February of 2010 as the pilot of mission STS-130 on board space shuttle Endeavour. During the flight, Virts and other crew members helped with some of the final assembly elements of the orbiting laboratory. During STS-130, the crew delivered the Tranquility module and the Cupola, an observatory module which provides a seven-windowed view in a dome-like configuration, to the station. NASA astronaut Reid Wisemen gained a large social media following and the public’s notoriety, not only for his science and engineering work while aboard the ISS, but for his photos and videos shared through social media sites like Twitter and Vine. Virts who is also active on Twitter will likely continue to provide striking images of the Earth’s surface taken during his time within the ISS’s Cupola module. Three spacewalks are scheduled for the beginning of next year, and are planned to be conducted by Virts and Willmore to attach a new docking aperture to the U.S. portion of the space station and the installation of a new Common Communications for Visiting Vehicles (C2V2) communications device. These extra-vehicular activities (EVAs) are being conducted to prepare the ISS for future crewed missions from commercial space companies, Boeing and SpaceX, in three to four years time. Several experiments will also take up a good portion of Expedition 42 / 43’s time while they are in orbit. NASA recently installed the first 3D printer (provided by Made in Space as part of the International Space Station Research Competition) to be operated in space. This technology will hopefully allow for on-board manufacturing of items by the crew when repairs or replacements are required. Not only can this be vital in a serious repair or maintenance situation, but can also help cut costs for delivering specialized parts to orbit on future missions. Another experiment currently being done aboard the ISS is Seedling Growth-2, which focuses on growing plants in microgravity. The continued research in the field of space-based agriculture is consider a critical aspect of long-duration mission in deep space, that are planned for the coming decades. After a six-hour ride to rendezvous with the ISS, the crew should be docked and aboard the $100 billion orbiting outpost late this evening. A team of three international crewmembers are finalizing their preparations for launch from the Biakonur Cosmodrome LC-1 in Kazakhastan which will take place on Nov. 23 at 4:01 p.m. EST (2001 GMT). This journey, which started years ago for the crew and technicians involved, will ultimately see these diverse space-bound explorers joining their fellow Expedition 42 crewmates aboard the International Space Station (ISS). NASA astronaut Terry Virts will be the only American aboard this launch, and will be joining his NASA counterpart Barry Wilmore who is already on the ISS. Born in Baltimore, Maryland in 1967; Virts is a Colonel in the U.S. Air Force, and previously flew to the ISS as part of the STS-130 crew aboard Space Shuttle Endeavor. This will be Virts’ first flight on the Russian Soyuz and he expressed uncertainty as to what he will be able to see during the flight via a conversation on Twitter. “I’m not exactly sure what’s between my window and fairing-dark metal and cables. At separation it will still be night outside,” Virts said. Besides being an astronaut, Virts is a bit of a celebrity, having appeared as a technician on the TV series, Star Trek: Enterprise. 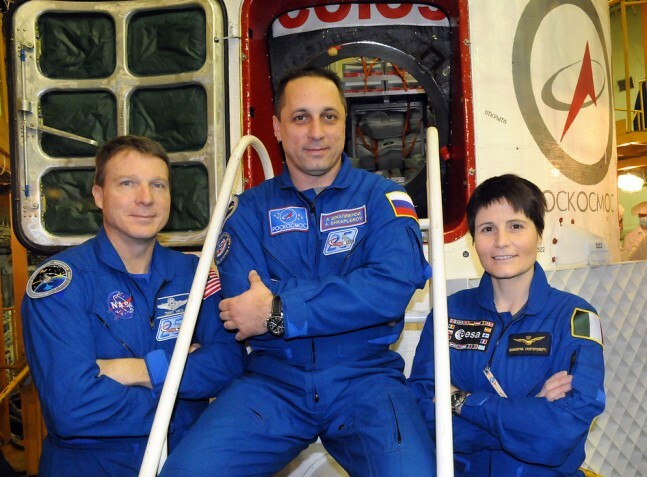 Virts won’t be alone on this flight, quite the contrary, he will be joined by two other members of their country’s Air Forces (all three members of this portion of the Expedition 42 crew are in their homelands’ Air Force) a fact denoted in the crew’s mission patch. Roscosmos’ Anton Shkaplerov has one previous spaceflight to his record which was a long-duration mission of 165 days, and will be joining his fellow cosmonauts Alexander Samokutyaev and Yelena Serova already on board the station. Shkaplerov is a retired Colonel in the Russian Air Force and will serve as a flight engineer aboard the orbiting laboratory. ESA astronaut Samantha Cristoforetti is the third and final member of this crew, this will be her first launch into space. She is a Captain in the Italian Air Force and the third female astronaut for ESA. Cristoforetti is a highly-skilled mechanical engineer who also speaks five different languages. Final integration of the spacecraft and launch vehicle was completed this week in preparations for the Nov. 23 flight. The Soyuz TMA-15M spacecraft was fueled and its on-board systems were checked late last week before it was moved to the integration facility to be matted to its Soyuz-FG launch vehicle. Soyuz-FG is the only current rocket used by the RSA for manned launches. Alone; It stands 162.4 feet (49.5 meters) tall and weighs 672,000 pounds (305,000 kilograms). Once the impressive array of engines fire, including the four main liquid-fueled booster rockets, the booster can deliver more than seven metric tons into low-Earth orbit (LEO). This flight will be the 47th launch for this rocket design, which includes 10 Soyuz-FG/Fregat variants. All steps from fueling checks to integration have been performed without incident and the rocket and spacecraft have been given a clean review, officials have said. After this was confirmed, ground crews began the slow process of moving the launch vehicle via rail out to the launch pad. The Soyuz-FG rocket, capped with the Soyuz TMA-15M spacecraft, was rolled out to the launch pad Friday, Nov. 21, a few days before its scheduled flight. Its placement in the launch complex marked the start of final preparations for flight. Crews will now spend the next two days going on all vital systems that will eventually lead up to fueling the launch vehicle and continuing to meeting critical deadlines in preparation for launch day. TMA-15M’s crew has spent the last few days relaxing when compared to their usual schedules which include a lot of hard-work and training in preparation for this launch over the last two years. Time was given to them to visit with their families and several traditions, including a final hair cut and health checks, were performed before they enter the spacecraft on Sunday. After blasting off to space, the crew members will travel for a scheduled six-hour spaceflight until they reach the ISS in orbit. During their flight the crew will orbit the Earth four times until their trajectory meets up with the space station. If all goes according to plan, the hatches should be open and the three new crew members will join their Expedition 42 counterparts around 11:30 p.m. on Sunday, Nov. 23. The Expedition 42/43 crewmembers will remain on the ISS, conducting science experiments and other vital tasks for station operations, until mid-May of 2015. “We may end up getting a few spacewalks, if not more it looks like, and, so it’s going to be a busy six months,” Virts said. 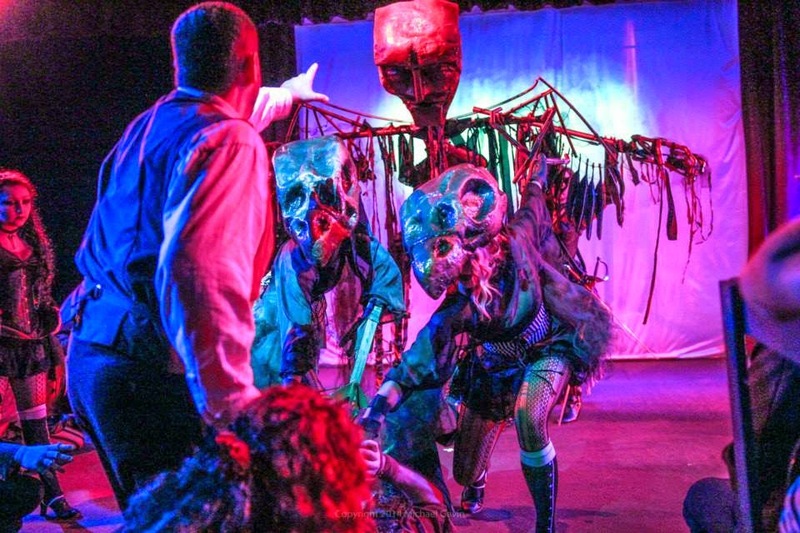 ORLANDO, Fla. — Phantasmagoria started as a slightly macabre and mysterious theater project in Orlando five years ago, and has continuously evolved over the years into something much greater. The fifth installment of this annual production entitled “Phantasmagoria V: Death Comes for All,” packs an engrossing encapsulation of year’s past, and opens a new book to a bigger and brighter future. “Its come to fruition. 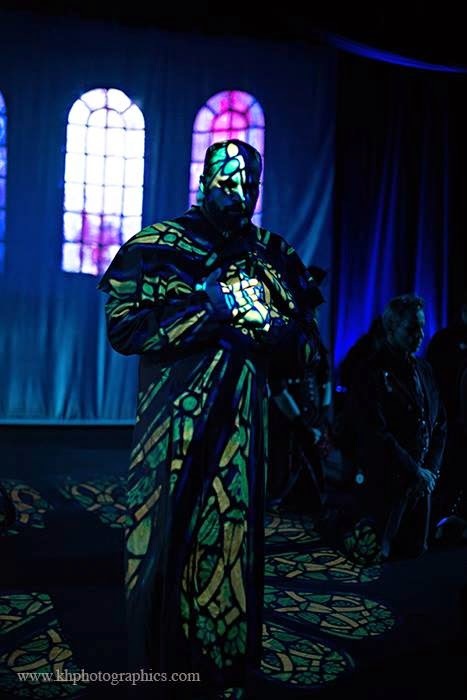 Its evolved so much over the years, and year one I never imagined this at all,” said John DiDonna, Phantasmagoria’s creator, writer and director. This production was originally based on the concept of a traveling troupe of storytellers who brought mischievousness and a unique style to a play designed to fit in around Halloween and be part of the Orlando Puppet Festival. The characters have developed over time and new elements have been continually added to give audiences something different to enjoy each year. Phantasmagoria IV ended on a solemn note last year, and this year’s show starts by picking up the scattered pieces. Throughout the show it becomes a family reunion of sorts as the storytellers and other performers find each other and become stronger as they reunite. Matthew Carroll, who plays Mathias in this production, has been performing with Phantasmagoria from the beginning. One element added this year is providing information to audience members about the back story and who these characters are. Slickly produced video introductions and a performer slideshow illustrates who the characters are and what brought them into existence.They are the spirits of imagination, and the conjures of fantasy who live and breathe in the stories all mankind has told throughout history. 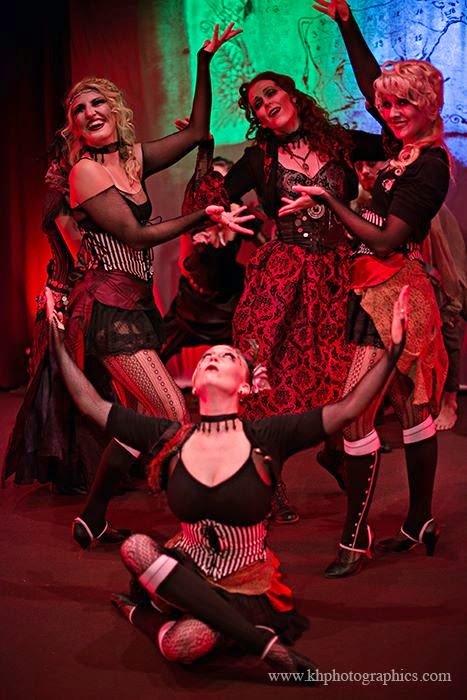 Phantasmagoria’s performers bring to life several stories by telling them in a unique style. They use alternating dialogue, puppetry, dance, visual effects, instruments and a number of other performing techniques to bring life to the stories told around the campfires of history. Stories in this year’s production includes work by well-known writers like Edgar Allan Poe, Charles Dickens, HP Lovecraft and Lewis Carroll. There is also a dark and haunting Norse Folklore tale called “The Midnight Mass of the Dead,” that is brought to life by the focused dedication of the cast and eerie lighting effects designed to create the aura of a haunted church in the dead of winter. Classic American literature, poetic diatribes, clever musings, and much more make up the stories shared by these performers. Another standout story from this year’s show is a twisted tale from Hindu Folklore called “The Tale of the Churel.” A woman is betrayed by her family during a moment of celebration and comes back as the spirit of death to seek her vengeance. This tale features music and movements inspired from Hindu culture and is followed by the “Dance of Kali” which creates an engrossing visual feast that defines what the Phantasmagoria experience is all about. Of everything this show has to offer; the most visually inspiring and touching moments come midway, with an feat of aerial mastery by Mila Makarova and her daughter Gina Makarova. What this mother and daughter tour de force does onstage is nothing short of amazing. They are both expert performers of aerial acrobatics, which include the use of silks and an aerial hoop, also known as a lyra. For the first time, these two perform together in a single lyra and create a stunningly beautiful visual display of talent that left theatergoers a gasp. 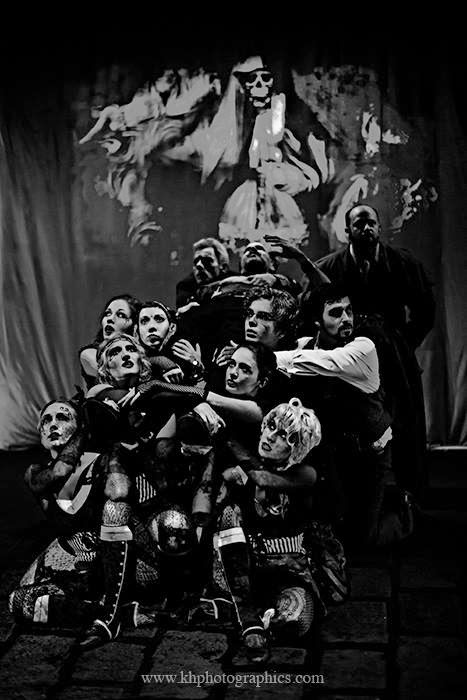 Phantasmagoria V blends literature, dance, puppetry and poetry into a wonderful post-modern theatrical tapestry. Next year’s show is already being written and bigger things are on the horizon.